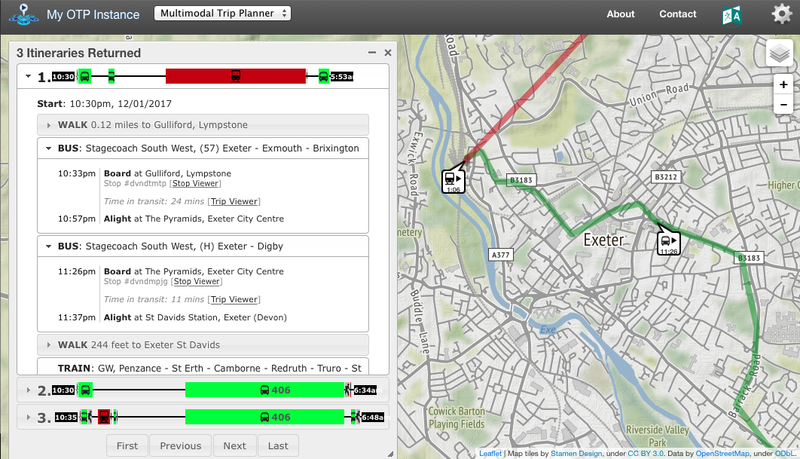 We’ve recently been converting our bus and train timetable data to GTFS. The General Transit Feed Specification is a simple data format for representing transport timetables as CSV files. Put forward originally by Google, it is now a widely adopted standard, particularly in the US, but increasingly in Europe and here in the UK. We are working on hosting our own journey planning solution, so as part of the “CATCH!” project, we created GTFS data to feed into OpenTripPlanner. As is often the case working with large timetable datasets, we made quick progress but then tackled a long list of issues to raise the data quality. We have reached the point where we are seeing reliable multi-modal journey planning results. At this point we’d like to hear from customers, new or existing, who may be interested in working with GTFS formatted bus and train timetable data. If this is of interest to you, please get in touch.